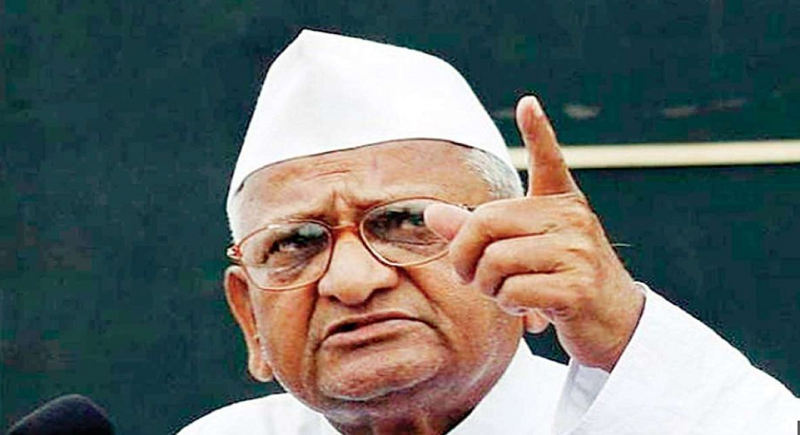 Mumbai, February 4: Social activist Anna Hazare whose indefinite hunger strike has entered the sixth day on Monday, urged the Centre to stand by the promises made in relation to immediate appointment of anti-corruption authority, Lokpal at the Centre and Lokayuktas in states. Hazare's demands also include implementation of Swaminathan Commission's recommendations for tackling agrarian distress and electoral reforms. "I will be returning my Padma Bhushan award to the President. I did not work for that award. You only gave me that while I was working for a social cause and the country. If the country or society is in this condition, then why should I keep that?" he warned citing the situation. Hazare has been on a hunger strike since last Wednesday at his native Ralegan Siddhi village in Maharashtra's Ahmednagar district, demanding appointments of Lokpal and Lokayuktas and resolution of farmers' issue. The 81-year-old was awarded the third-highest civilian honour of the country in 1992. Hazare has lost 3.8 kg in the past five days and his blood pressure, blood sugar and creatinine level in the urine had gone up, confirmed the doctor. Around 5,000 farmers from the district are likely to stage a protect outside the Ahmednagar collector's office today to support his agitation, his associates said. “The decision to hold the protest was taken at a gram sabha at Ralegan Siddhi on Saturday night. Leaders of various political parties from Parner tehsil were present at the meeting”, they added. Anna Hazare is an Indian social activist who led movements to promote rural development, increase government transparency, and investigate and punish corruption in public life. In addition to organising and encouraging grassroots movements, Hazare frequently conducted hunger strikes to further his causes. Meanwhile, Maharashtra minister Girish Mahajan and senior Congress leader Radhakrishna Vikhe Patil on Sunday met social activist Anna Hazare at his native place with a letter from Maharashtra chief minister Devendra Fadnavis. CM had asked Hazare to withdraw his hunger strike as most of his demands had already been announced in the Union budget and considered by the Maharashtra government.